Tokyo Tapes is a live album by German heavy metal band Scorpions. "Tokyo Tapes" was Scorpions' first live album, recorded at Sun Plaza Hall (Tokyo, Japan) on April 24 and 27, during the band's Japanese tour in 1978. These shows were guitarist Uli Jon Roth's last performances with the band, who had announced his departure after the release of Taken by Force. 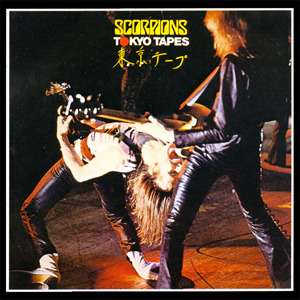 Tokyo Tapes includes songs from all Scorpions' albums released before 1978. The songs "Hell-Cat", "Catch Your Train" and the Japanese national anthem ("Kimi ga yo") were also performed during these shows but were not included in the official album. On the 2001 EMI re-mastered CD, "Polar Nights" was omitted so as to fit a single CD, although it was included on the re-mastered version of "Taken by Force". The earlier two CD release, however, is the original album in its entirety. In Asian markets, an alternate cover of a Scorpion on a rose is used rather than the live shot of the band used for most other markets. Roth commented about the recording of the album: "Tokyo Tapes was a peak time, we have played together for all these years and it all came together at that time. Particularly on the first show, which unfortunately wasn't recorded. There were three shows in Tokyo, the first one was by far the best, but the second one was good too. Those are the ones on the album, the second and the third that were used. The first one I thought was a lot better and I was disappointed that it wasn't recorded."